Fracking has probably been the only energy issue to surface in the Scottish Parliament election campaign. The Tories support it, Labour oppose it, and the SNP are sceptical, but not ruling it out. As we have previously reported, the energy minister Fergus Ewing is clearly pro-fracking, but we suspect Nicola Sturgeon is more sceptical - either from conviction or political judgement. If it's the latter she might want to read the latest Department of Energy and Climate Change (DECC) public survey about their views on different energy types and how they use energy in their daily lives. 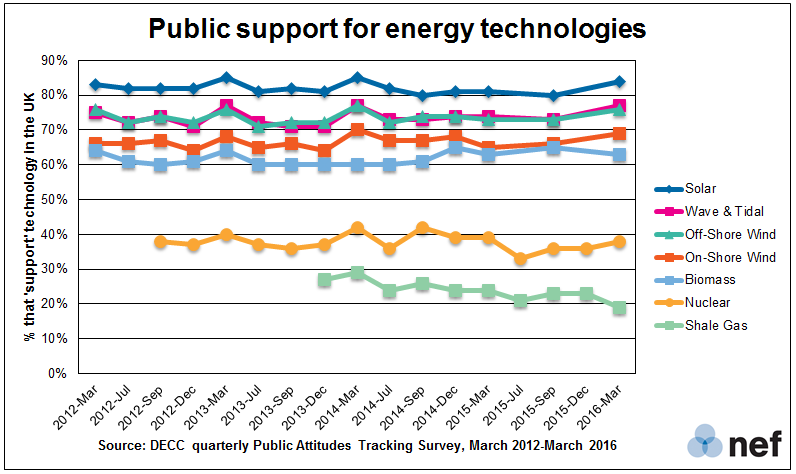 The headlines show 81% of the public support renewable energy, with over a third “strongly” supporting it. Only 19% support fracking. "We are deeply sceptical about fracking and have ensured that no fracking can take place in Scotland by putting in place a moratorium. We have also put in place a very thorough research process and plans for a public consultation so that any decision is based on both evidence and public opinion. Unless it can be proven beyond any doubt that there is no risk to health, communities or the environment, there will be no fracking or UCG extraction in Scotland." This 'beyond any doubt' position is probably closer to the views of most SNP candidates, particularly those in the central belt fracking zone. There have been several 'no shows' by SNP candidates at hustings on this issue. Ineos continue to suggest that they expect fracking to be approved - pretty unhelpful to the First Minister who continues to refuse to release a full version of her meeting with the company. The pro-fracking lobby will have been encouraged by a paper written by Professor Younger from Glasgow University who says that there is no risk to water supplies from fracking. On the other hand, The Ferret reports that studies in the USA show just how fracking has contaminated water supplies. "It is because of the need to tackle climate change that we will ban fracking in Scotland. The science is very clear that the last thing we need is to burn another fossil fuel. Rather than a temporary freeze, or studies which report a few years down the line, our position is very clear — no I fs, no buts, no fracking under Labour." This position is reinforced by an authoritative new study from the US Environmental Protection Agency which says fracking is set to lead to a sharp rise in emissions of climate changing greenhouse gases. This undermines industry and government claims that shale gas is a relatively clean fuel that can help combat global warming. So, the environment case for or against fracking remains in doubt, which makes it difficult for the industry to meet the new, more sceptical, SNP manifesto position. The climate change argument against fracking remains strong and many analysts still doubt it's economic viability at current gas prices. The public are clearly with Labour on this one - no ifs, no buts, no fracking.